I’ll admit something to you: I like my drinks a little girly. I want my cocktails to taste good and not too much like liquor, though on occasion, a scotch or bourbon on the rocks hits the spot. I’m not shy about adding fruit and sugar and I love herbs of all kinds all up in my drinks, too. 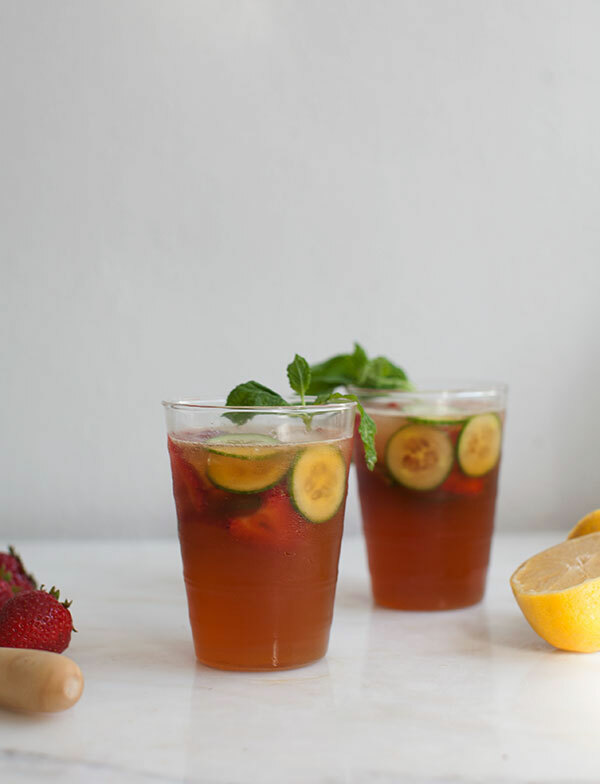 Pimm’s Cup is definitely at the top of my favorite summer cocktails. It’s refreshing, effervescent and straight delicious. 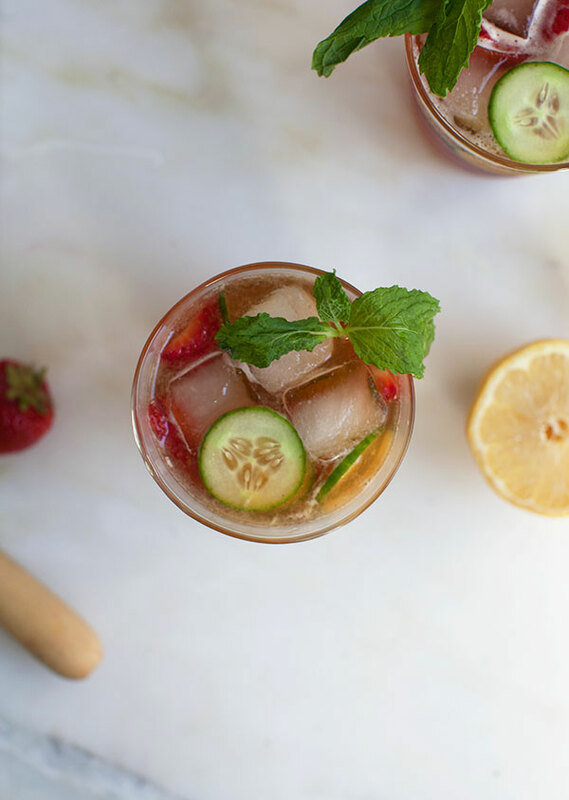 There are a few different iterations of a Pimm’s Cup. 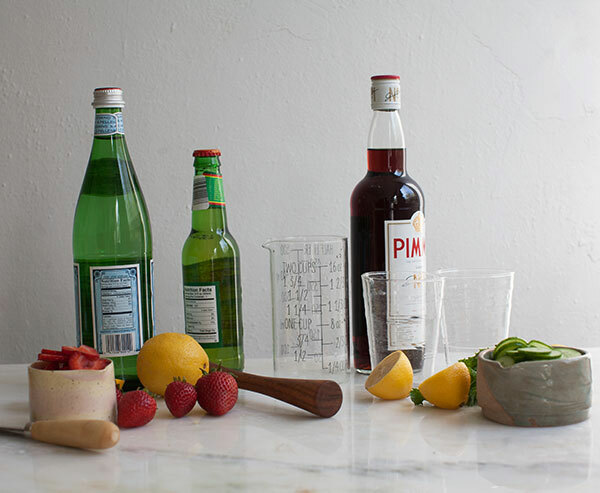 Some are made with lemonade, while others use ginger beer. I like a bit of both in my Pimm’s Cup. In order to avoid having to make a whole batch of lemonade, I like to add a bit of sugar to the bottom of a glass and muddle it with a few slices of cucumber. And then I pour in a few splashes of fresh lemon juice. It’s topped with Pimm’s No. 1, ginger beer and a bit of sparkling water. 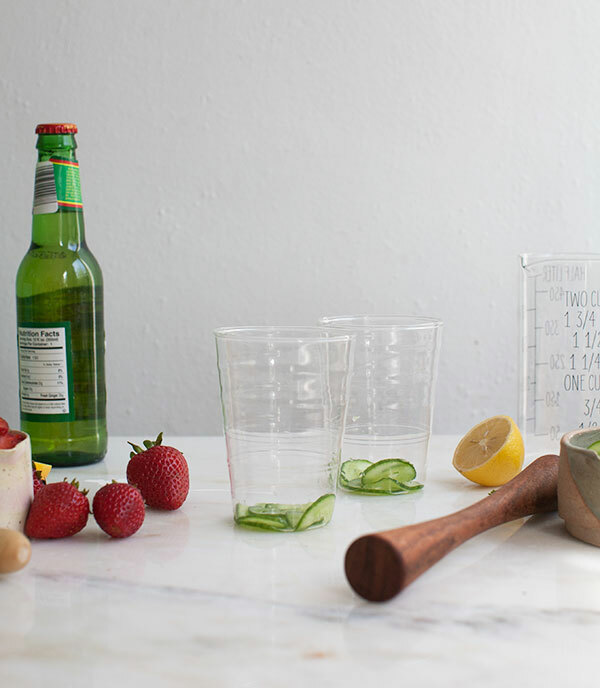 The slices of strawberries and cucumber mean that this cocktail has built in snacks (a plus!). If you like, you can skip the ginger beer and sugar and use store-bought lemonade. Or if you dislike lemonade, you can skip the lemon juice and sugar and use all ginger beer. Your call! This cocktail is begging to be enjoyed on a lazy summer day, while sitting on a porch reading a book. Add a few slices of cucumber and 2 teaspoon of sugar to each glass. Using a muddler (or you could use the opposite side of a wooden spoon), smash the cucumbers and sugar gently. Drop in a few ice cubes to each glass, along with the lemon juice. Pour in 2 ounces of Pimm’s No. 1 to each glass. Top with about 3 ounces of ginger beer and a splash of sparkling water. Give it a taste and adjust according to taste. You may like a splash more Pimm’s. Garnish with more cucumber slices, strawberries and sprigs of mint.